The Maryland Department of Natural Resources – Wildlife and Heritage Service plants sunflowers each spring on the McKee-Beshers Wildlife Management Area (WMA). 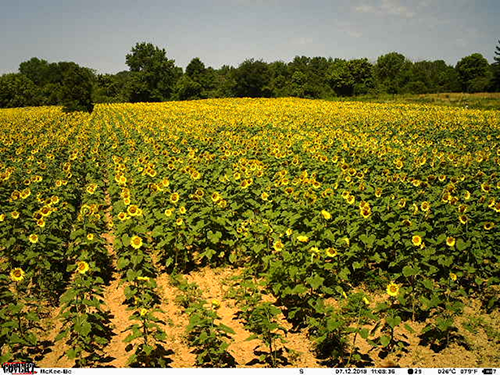 The primary purpose for planting sunflowers on wildlife management areas is to provide a food source for wildlife. These fields are located on River Road, east of Hunting Quarter Road, and on the corner of River Road and Sycamore Landing Road. The many benefits of sunflowers are lost when they are cut or trampled by people. These sunflowers are planted for the benefit of wildlife and regulations prohibit the cutting, destruction or removal of any plants from these areas. The public is welcome to visit, admire and photograph the sunflowers in bloom. However, visitors must be responsible and ensure that their actions don’t have negative consequences.